hen Deborah Bell arrived on her first medical mission in San Raymundo, Guatemala, she was greeted by a helpless mother clutching her unconscious 10-month-old child at the clinic’s doorstep. The family hiked several miles up the hillside to seek medical assistance for their son, who had been suffering from severe diarrhea for over a week. The child was so dehydrated he couldn’t even shed a tear. Bell, a nurse practitioner student at the time, treated him with IV fluids and antibiotics to kill the amoeba viruses attacking the boy. The virus had made its way into his tiny body through contaminated water. After an hour of waiting, the family became restless. “If we don’t leave now, we won’t be able to get home before dark,” said his mother. Without a moment to spare, she carried her son out of the clinic and began their journey back home. Bell watched helplessly as the family faded into the darkness. While his symptoms were temporarily cured, she knew they would return home and continue drinking from the same contaminated water source that made the boy sick in the first place. The team had come prepared with First World medicine to treat long-term Third World problems. “What have we done?” she thought. When Bell founded Refuge International in 2001, she was determined to help the people of Guatemala find clean water and receive medical care. “The idea that children die from diarrheal illness in a country that is two hours and 45 minutes for me to fly to is unacceptable,” she said. Refuge International’s first major fundraiser raised $10,000 for the purchase a portable water drill to build wells around Guatemala in search of pure water sources. 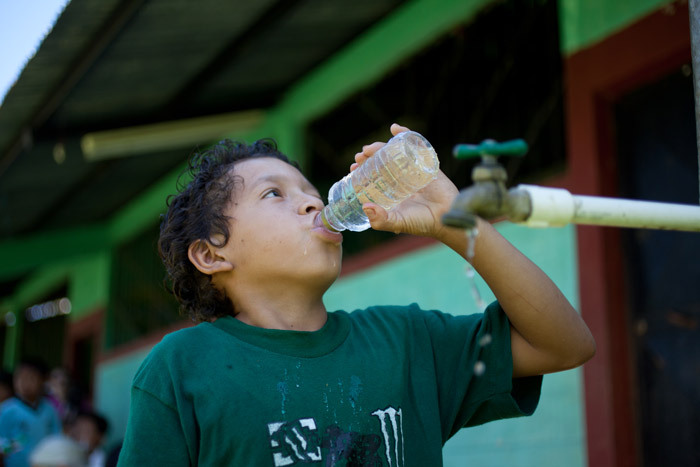 In 2006, Bell decided to build the first water well in Sarstun, a small, secluded aldea (village) located on the Sarstun River that forms part of the border between Belize and Guatemala. Zoila Gonzalez, 48, a nurse at the Sarstun clinic, said the well’s effects on the community were visible within six months. In 2012, over 200 cases of diarrhea were reported in Sarstun. In 2013, the number was halved to 98. Refuge has drilled over 18 wells to date. Since the water project’s inception eight years ago, there has not been a single report of diarrhea-related death in children. San Juan is a humble village located on the outskirts of Sarstun. 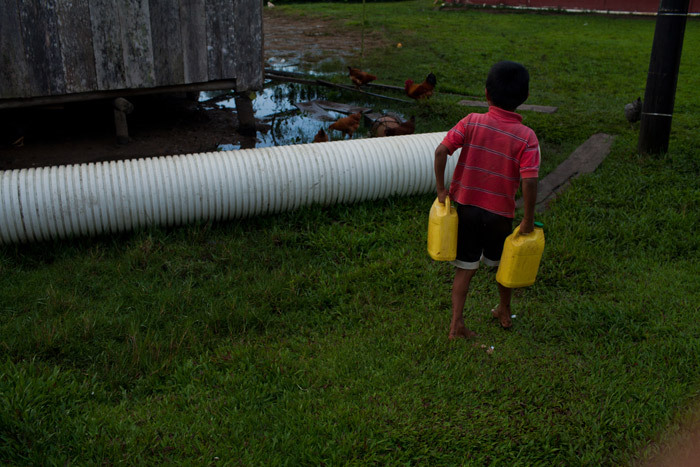 In 2005, Refuge International built a massive water tank near the center of town that pumps water to about 35 families. The well provides locals with water to consume, wash dishes and do laundry. The Comite Desarrollo Comunal (CDD) oversees the maintenance of the well, which is funded by the community. Nolberto Felixe Ccarmo, 61, a priest at the local church and committee member, said the fees are a small price to pay for the benefits of the well. However, only people that are physically close enough to the well can have direct water lines to their homes. The committee is planning to begin a tubing project to give the entire community access to the wells in their homes within the next year. Ccarmo said he hopes to find a sponsor for the project so that all children can have ready access to water in their homes. Underground water pipes connect the water line to a nearby elementary school, providing school children with clean water. Blanca Hernandez, a kindergarten teacher in San Juan, began working for Refuge International in 2008. Before the school’s water line was installed, Hernandez said the children would pull water from the central water pump and bring buckets of water to school. “Now, when the kids are thirsty, they can drink water because it’s so close by. When they get dirty, they can clean themselves off,” Hernandez said. Her students no longer suffer from frequent stomach pains, diarrhea or vomiting. Now that Refuge International has established a presence in Sarstun, more villages have recognized that clean water is possible. Refuge International also provides Sawyer filters in areas where drilling is impossible. The filters are recognized world-wide as an effective way to filter water for long periods of time for just $50 a piece. The organization has recently acquired a hydraulic drill with a 400 ft. drilling capacity. Bell said Refuge International will travel to western Guatemala to provide coastal cities with clean water in the near future.